where NaCH3COO is the sodium acetate salt in this simple acid-base neutralization reaction. This experiment evolved over the years to my using the CO2 to pop corks and inflate balloons. This was the age of "Watch Mr. Wizard" on black-and-white television. I wrote about Donald Herbert, who played Mr. Wizard, in a previous article (Mr. Wizard, June 14, 2007). There's only so much you can do with household chemicals, many of these are not really safe for children (e.g., lye), and some of them are dangerous when combined, like ammonia and bleach. For those reasons, I was happy to receive chemistry sets (see figure) for Christmas and birthdays, along with science-oriented kits containing microscopes (that never seemed to work very well), telescopes (refractors that never seemed to work very well) and the like. Having a father who was a carpenter with a well equipped shop helped a lot with the experimentation. Nothing seemed that dangerous, and we were the generation that played safely on the streets. 1940s era Gilbert Chemistry Set (photo by Joe Mabel). The US Consumer Products Safety Commission has just decided to come down hard on manufacturers of science kits for children, even those used in classrooms, by defining these as "Children's Products. "[3-4] Children's Products, of course, face very tough safety rules. Science kit makers argued that most of the items in kits are everyday items found in homes and schools, such as paper clips and rubber bands. This ruling would require them to do safety testing on rulers included in their kits, although rulers sold in supermarkets do not need to be safety tested. The new ruling may encourage science kit manufacturers to eliminate their kits for the twelve and under age group, for whom these rules apply, and market only to the older students. Need I say that if a student doesn't become involved in science by age twelve, he or she never will. There's another coffin nail for the future of US science. A pink microscope for girls, and other kid's themed equipment, would be subject to the new safety rules. Fortunately, professional instruments, such as full-sized microscopes, will not be considered children's products, although they may find use in a classroom. A well-heeled private school can still get the science equipment it needs if less expensive children's versions are not available. Inner city schools would not be as lucky. Science kits are sold not just into classrooms. I owe my career choice to science kits I received from my parents. I'm sure we'll see more science-themed computer programs marketed in place of traditional kits. Most of these will have flashy animations and hip background music thought to appeal to children, but that's not the same as hands-on experience. 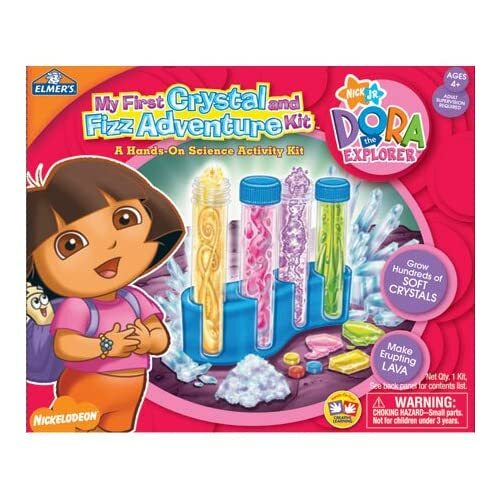 There will be fewer crystal growers in the pipeline after kits like the "Dora the Explorer - My First Crystal and Fizz Adventure Kit" get reduced in scope to a coloring book of crystals, or are pulled from the market entirely. Most science kits sell less than 100,000 units, but even at that volume, the extra testing would amount to a just a small fraction of a dollar on each kit. The problem, however, from the manufacturer's standpoint is that the kit sales happen over five to ten years, but all the testing expense comes before any sales are made. If an item fails a test - a ruler, for example, has a rough edge when molded - there's a redesign required and a delay to product introduction. When too many NREs (non-recurring engineering expenses) and too much risk enter a product marketing decision, the product will not be introduced. Obviously, some oversight is required. Recalls of children's science kits happen all the time, but these are in response to a reported incident that the new required testing may prevent. Powerful magnets, when ingested by younger siblings or pets, can be very dangerous and often require surgical intervention if more than one is swallowed. "Rising Above the Gathering Storm, Revisited," the recently released update of the 2005 "Rising Above the Gathering Storm" report on US science education, paints a bleak picture of US science education. More money is being spent, but to no result. In particular, here are excerpts that I quote from the report. • The World Economic Forum ranks the United States 48th in quality of mathematics and science education. • 30 years ago the United States had 30 percent of the world's college students. Today we are at 14 percent and falling. • Twenty years ago the U.S. was first among industrialized nations in share of population with a high school diploma and first with a college degree. Today, we are ninth in high school diplomas and seventh in college degrees worldwide. • We are 18th out of 24 in high school graduation rate among industrialized nations . . . and falling. • Nearly 30 percent of American adults do not know the earth revolves around the sun. • 16 percent do not know that the center of the earth is very hot. • Nearly half do not know that electrons are smaller than atoms. • Only about half the population is aware that dinosaurs and humans never coexisted. • The United States is now 20th in high school graduation rate among industrialized nations. • Overall, 47 percent of U.S. four-year college students fail to graduate within six years. • Over the last decade or so, the United States has fallen from first to 16th in college graduation rate. • In international standardized tests involving students from 30 nations, US fourteen-year-olds rank 25th in mathematics and 21st in science. • If United States youth could match the performance of students in Finland, America's economy would be between nine and sixteen percent larger; that is, between 1.3 and 2.3 trillion dollars larger each year. • Each year, United States universities award about 150,000 MBA's and 44,000 law degrees, compared with 68,000 engineering (undergraduate) degrees and 8,000 engineering PhDs. That last point is especially interesting. Many other reports have found top science and engineering students migrating to better-paying jobs in finance, law and medicine since the 1990s. Industrial scientists are an unfortunate class of professionals who are not in personal charge of their own employment. As stated in the "Revisited" report, eighty percent of chief financial officers of US firms polled indicated they would cut research and development to meet their next quarter's profit projections. It's becoming all too obvious why students choose not to become scientists. What will it take to get children excited enough about about science to choose it as a career? Science kits? Not any more. Common Cleaning Products May Be Dangerous When Mixed, New Jersey Department of Health and Senior Services, Division of Epidemiology, Environmental and Occupational Health, Consumer and Environmental Health Services. Jennifer C. Kerr, "Kids' science kits may take hit from safety ruling," The Telegraph, Macon, GA 31208, September 29, 2010. Available also from Yahoo News. Final Interpretative Rule: Interpretation of Children's Product, Consumer Product Safety Commission, August 25, 2010. U.S. Consumer Product Safety Commission, "School Specialty Publishing Recalls Children's Science Kits for Thermal Burn Hazard," Press Release Release #06-240, August 22, 2006. The battery case in these voluntarily recalled science kits can overheat. There was one report of a young boy receiving minor burns to his fingers. Members of the 2005 "Rising Above the Gathering Storm" Committee, "Rising Above The Gathering Storm, Revisited," The National Academies Press, 2010. Linked Keywords: Sodium bicarbonate; acetic acid; carbon dioxide; Donald Herbert; ammonia; bleach; microscopes; telescopes; refractors; carpenter; Gilbert Chemistry Set; US Consumer Products Safety Commission; well-heeled; crystal growers; Dora the Explorer - My First Crystal and Fizz Adventure Kit; NRE; non-recurring engineering expenses; Rare-earth magnet; Industrial scientists; professionals; research and development.